Massage Green Spa - Get Involved. Make Friends. Enjoy Motherhood. 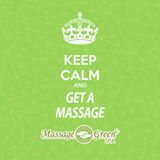 Here, at Massage Green Spa, we strive to bring peace to your mind, body and wallet via a broad range of massage and aesthetic (facial) services at industry-leading prices. Book your appointment today and discover an affordable approach to healthier living. Begin your relationship with Massage Green Spa at unbeatable introductory pricing and continue that relationship with our liberating, no-contract household membership. Without contract, provide your household with member pricing and privileges for a single purchase of $39.95 each month. Your household may use that $39.95 towards any of our services and enjoy member pricing for any additional services within the month. *Offer valid on first visit only. **All appointments of one hour or greater include 5 minutes for undress/consultation and 5 minutes for redress. MOD Moms Discount:Free aromatherapy with each massage appointment. 50% off fruit enzyme with each facial appointment.